I do not claim to be the wisest woman in all the land, with lo my 2 1/2 years of marriage, but let me impart some wisdom on to you, oh Internet. Wisdom which, hopefully, will lead you to a delicious and happy life. Wisdom number 1: If your husband is from the Northern lands, trust him with fish. Even if you just wanted salmon to make sliders this week, and your eyes goggle out when he returns with a $24 package of just 1 3/4 pounds of fish. Trust him in this – he has magical knowledge which leads him to the delicious-est fishes. Sub-wisdom number 1: If your husband knows how to divide and grill fish, make him do it. If you’re like me, you’ll wind up with some funky-sized and -shaped pieces which cook funny otherwise. Wisdom number 2: If your husband declares dinner the best thing you’ve ever made, make it again. We had this recipe for dinner on Sunday, thinking just to use up some of the ‘extra’ Atlantic fresh-caught salmon Bill chose before I made sliders for dinner on Monday. Behold, we had this exact recipe 3 nights in a row. It is delicious. So, yeah. Bill and I made the best, most delicious salmon of all time. And it is the SIMPLEST marinade. I do not know what sort of hoodoo voodoo is contained within the Williams-Sonoma Newlywed Cookbook that my aunt gave us when we got married, but I trust in it. And you should too. Succulent, flavorful, simple salmon, topped with a tasty herbed compound butter, served alongside oven potatoes with a salty Parmesan zip and spinach sauteed with shallots. I mean, are you drooling? I mean, the butter just melts into all the little crevices of the perfectly cooked salmon, turning in into this creamy luscious main dish, with the fresh green pop of spinach and the crispy crunch of the potatoes. The balsamic and parmesan used throughout the dish make it a truly cohesive dish that’s not too heavy, but is perfectly filling. This recipe may seem a little complex, but I have timed just right after making it so many nights in a row! First, make your delicious compound butter. Place butter, ¼ cup Parmesan cheese, 1 teaspoon balsamic vinegar, and the herbes de Provence in a food processor. Pulse butter mixture in food processor until well-combined, add pepper to taste. Scoop out butter mixture into a plastic ziptop bag and squish into a cylinder. Place in refrigerator for at least 1 hour. Combine 2 Tablespoons balsamic vinegar with diced garlic, 2/3 cup olive oil and thyme in a wide, shallow dish. Add salmon fillets to marinade dish and turn to coat well. Cover dish and place in refrigerator for 20-30 minutes. Now, get the potatoes going. Line a cookie sheet with aluminum foil, and add potato rounds. Add 1/3 cup olive oil, sea salt and pepper to potatoes on cookie sheet. Lift up edges of aluminum foil and shake to combine all ingredients. Place cookie sheet in oven and bake for 20 minutes. Top potatoes with ½ cup Parmesan cheese, and return to oven for 5 minutes. Heat a grill pan over medium heat. Melt a pat of the compound butter over medium heat in a medium pan. When butter is melted, add shallots and spinach. Stir constantly until spinach is wilted, then cover the pan and remove heat. Turn the oven off, but keep the potatoes in to continue crisping up that yummy cheese. When grill pan is heated, add salmon fillets and a nice glug of marinade to the pan. (The oil from the marinade will keep the fish from sticking). Cook the salmon for about 3 minutes on each side, or until crisp on the outside and opaque all the way through. Serve salmon fillets with potatoes and spinach, topping the salmon with another slice of the compound butter. Before I met Bill, I wasn’t a huge piscivore; the only fish you really run into in East Texas are catfish and crawdads, so I’d just never been exposed to a huge amount of seafood outside of Red Lobster. My husband, on the other hand, grew up in the icy North where the fishes basically fly onto your dinner plate (I may be exaggerating), so he was a huge lover of the swimmers of the sea (and lake and river). Luckily for his tastes, our local grocery chain, HEB, has a very nice selection of high-quality fresh and frozen fish since we live down near the coast now. We try to have fish, be it home-cooked or sushi, for dinner at least once a week to get all those good brain food nutrients and tasty flavors. This week’s fish case winner was trout! I’d never had trout (as far as I know), but Bill remembered a recipe from his childhood wherein a ketchup and brown sugar sauce was smeared on the whole fillets and then baked. When he recounted this to me, I replied that the sauce he described sounded just like… barbecue sauce, so we decided to cut some steps out and just use the bottled stuff for this simple recipe. Since trout is a heartier fish, it can stand up to the barbecue sauce without getting lost. Trout is low in calories but high in protein, so it makes for one of those elusive healthy treats that you’ll actually enjoy. The end product was moist, flavorful, fresh and delicious! Preheat oven to 350° F. Rinse fillets and pat dry. Line a baking sheet or casserole dish with foil and spread a thin layer of barbecue sauce on the bottom. Season fillets with salt and pepper, then place on top of the barbecue sauce. Generously top the fillets with additional barbecue sauce. Bake for 20-25 minutes, or until the fish is opaque and flakes easily to the touch of a fork. This is the simplest recipe, but it is also oh so tasty! We used Jack Daniel’s BBQ sauce on our trout, but you could also try a homemade barbecue sauce. We enjoyed this yummy fish with leftover sides from Easter lunch, but I think it would make a great salad topper or sandwich as well. Click here to download a PDF of this recipe! Add all ingredients besides Mahi Mahi to a medium bowl and whisk well to combine to create marinade. Pour prepared marinade in a large ziptop bag and add Mahi Mahi filets. Make sure to fully cover filets with the marinade. Seal the bag and place in the refrigerator to marinate for at least four hours, preferably overnight. After the fish has marinated, heat a non-stick skillet to medium heat on the stovetop. Add fish and all marinade. Cook for 5-7 minutes on each side. medium-high to reduce the marinade. Cook for 2-4 minutes, or until thickened and delicious. Remove skin from fish and serve topped with reduced marinade. 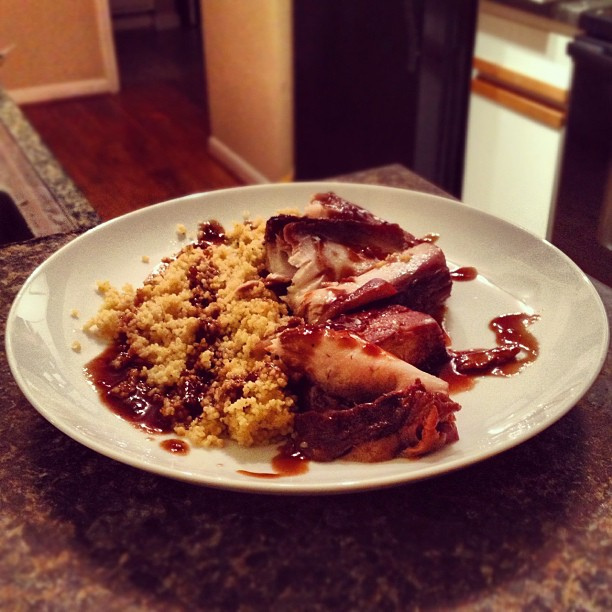 We serve it with couscous on the side to help soak in all of the tasty sauce. You should definitely try this one out! Download a PDF of this recipe here!